Get your double cash, now through December 7th. This week, GTA Online players can enjoy double cash payouts and RP, as well as discounts on a number of customization items. Drop Zone, Power Play, and Kill Quota have all been given the added bonus of double cash for those who compete in these specific modes, as well as a boost in RP earned. This is available through December 7th. 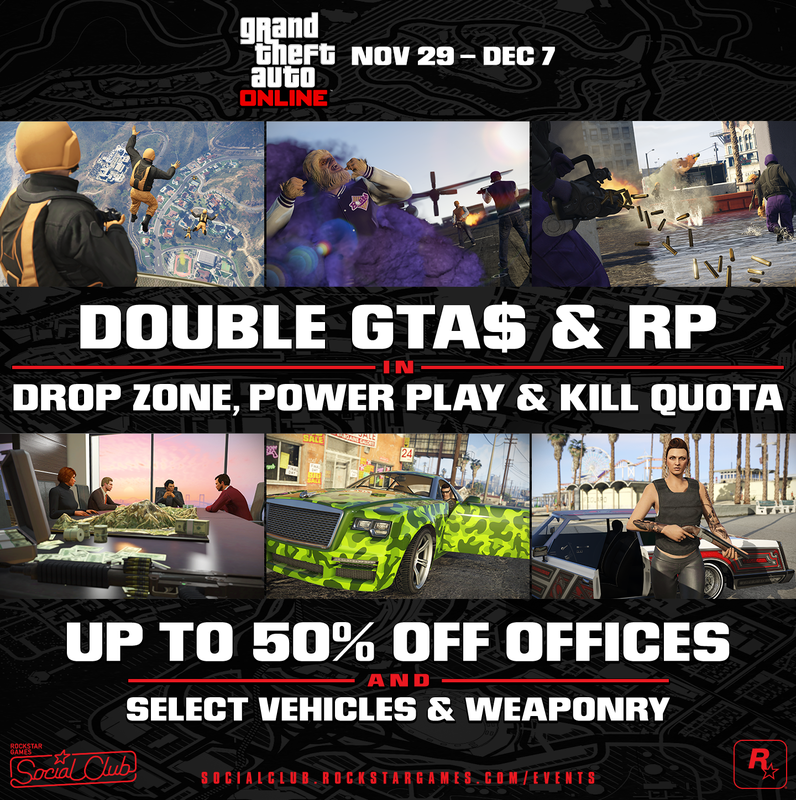 Additionally, players can enjoy discounts on vehicle and home customization options, including Executive Offices and decor, the Buzzard Attack Chopper, Vapid Desert Raid, Pegassi Reaper, and Enus Windsor. Shotguns, sniper rifles, and body armor are all discounted from their normal price. Stunt props have also been added as customization options in the Creator, including set pieces, ramps, signs, and building blocks. Finally, a new race mode called Turbine is available, allowing players to race each other around the wind farms of RON Alternates for the triple RP and the chance at some great prizes. For a full list of information on this week’s update, visit the official Rockstar Blog. And for more on Grand Theft Auto Online read our official Grand Theft Auto V review. It wouldn't hurt that game to keep the cash and RP doubled permanently.